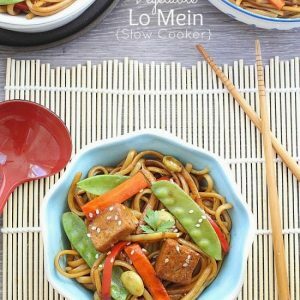 This vegetable lo mein makes an easy slow cooker meal that is flavorful and versatile. Whisk together all the ingredient for the sauce in the slow cooker. Add minced ginger and garlic. Add the entire block of tofu to the bottom of the slow cooker. Cook on low for 1-2 hours or high for 1 hour flipping halfway through. Meanwhile, prepare noodles according to package directions, set aside. Transfer tofu to flat surface and cut into cubes. Add tofu and remaining vegetables to slow cooker, cover and cook for 1 hour on high. 30 minutes before serving, add noodles into slow cooker. To thicken the sauce, whisk together cornstarch and water in a small bowl and stir into slow cooker. Allow sauce to cook and thicken on high for 30 minutes. Give everything a good stir to combine and coat with sauce. Serve hot and garnish with sesame seeds, if desired. Make sure hoisin sauce is vegetarian safe otherwise substitute with an equal amount of peanut butter and miso paste, or a homemade hoisin sauce recipe.